For the last four years, Mazda’s CX-5 has topped the mid-size SUV charts consistently outselling its rivals by quite some margin. And this year’s model is looking odds-on to follow in its predecessors’ tracks. But what’s so great about it that Australian motorists are falling over themselves to pick one up? Now it’s no secret that SUV drivers generally tend to stick to the roads rarely taking their cars anywhere more taxing than the local beach car park. So it’s always a little surprising to see more AWD than FWD options on an SUV that is primarily for highway and inner-city driving. Physically the model variants are practically the same with wheel size being the only noticeable exception. But when it comes to engines and safety features, we start to see some differences. There are three engines to choose from, but these depend on your choice of model variant. 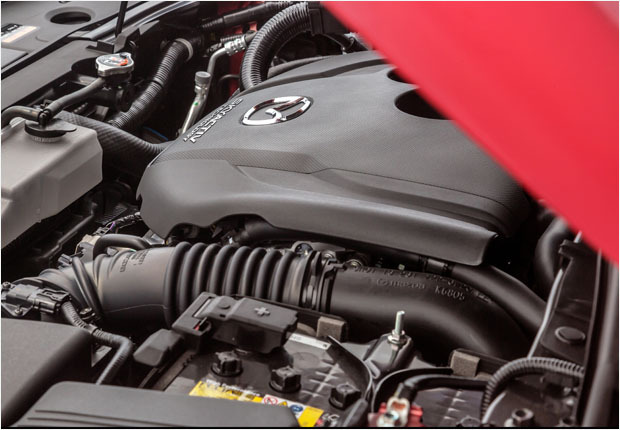 Mazda’s six-speed SKYACTIV-Drive automatic transmission comes as standard across the range. However, if you like a little more control over your shifting, then your only option is the FWD 2.0L petrol Maxx. It’s an unusual move to limit manual transmission options so drastically, but the sales figures don’t lie. This is obviously what the general CX-5-driving public want. While comfort is pretty standard across the range, there are some obvious tech and convenience differences as you move up the grades and we’ll get to that later. There are three trim options for the CX-5, but these are limited to particular model variants. Black cloth is the standard for both the Maxx and Maxx Sport variants while Touring models have a rather unusual combination of black Maztex (a fancy name for vinyl) and black suede. At the top of the range, the GT and Akera models boast a leather interior which you can choose in black or white. Yes, that’s white, not cream or tan but pure white. 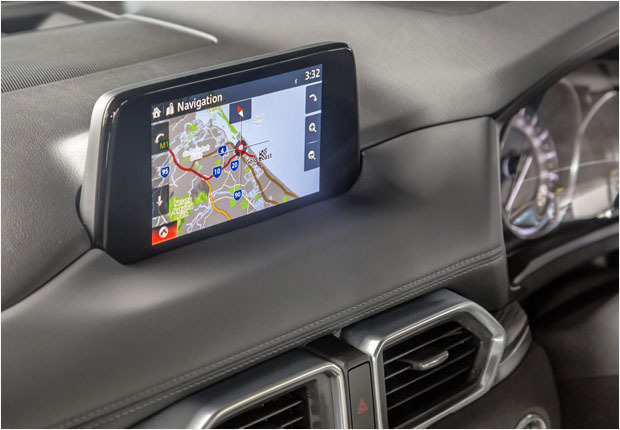 Every CX-5 comes with Mazda’s seven-inch colour touch-screen display, but on the Maxx, this is purely for media controls and doubles as a monitor for your rearview camera. For the rest of the range, this is where you’ll find the SatNav. Maxx drivers also miss out on automatic headlights and wipers and dual-zone air conditioning. The missing auto headlights and wipers are a bit of surprise as this tech is becoming standard on quite a lot of cars recently. If you want keyless entry, then you’ll need to opt for any model from the Touring variant up while a powered tailgate is only available to GT and Akera owners. Some of these features, however, are limited to specific model variants with quite a few missing from the Maxx base model. While we mentioned earlier that each model looks very similar, it’s quite easy to personalise a CX-5. Mazda offers a huge range of accessories for both the interior and exterior of all Cx-5s. But to really set your CX-5 apart there’s the Kuroi Sports Pack. This will set you back $2152.63 and includes spoilers and mirror caps. The good thing about the Mazda warranty is that there are unlimited kilometres in your three years of cover. Servicing rates are standard for each model, but they are not capped for any set period of time. So best to check with your dealer or the Mazda website for specific details for your chosen model. Just like the Mazda 3, the CX-5 range boasts quite a large range of model variants. Prices start at $27,890 for the base Maxx model which is in line with the 2016 price while a fully loaded top-of-the-range Akera will set you back $49,990. The truth is though that with the Maxx missing out on practically everything that now comes as standard on most cars, the base model just isn’t worth it. Best to start with the Maxx Sport which at least has those auto headlights and wipers every other car has. If you’re in the market for a new SUV, then you can’t go too far wrong with the CX-5. It’s pretty good to look at, easy to drive, and economical enough for an SUV. But instead of asking your dealer about finance you should talk to us. Not only will we find you the best finance package deal on the market but we’ll make sure that it’s the right one for you. So give us a call or fill out our car finance application form and we’ll be sure to get back to you as soon as we can.